IP Management & Budget Cuts: Have Your Cake and Eat it Too! Unless you've been shipwrecked on a remote island in the South-Pacific, you are probably aware that we've got somewhat of a global economic downturn on our hands. While no one really knows how long it will last, I think we can all attest to the fact that it is having an effect on what had become a fairly comfortable state of "business as usual." Already we are seeing the all too predictable rounds of budget cuts and layoffs at many companies in a multitude of industries. IP departments and the portfolios they manage are often perceived as matters of legal expense and are often the target of corporate cost cutting measures. In the economic downturn they are being asked to contribute even greater expense reductions to the corporate good. While it is easy for a corporate finance department to arbitrarily allocate a 20% budget cut, it is not always easy for the IP department to implement those cuts. Should the cuts come from allowing certain patents to expire? What if they are core to a revenue stream of the company? Should the cuts come from applying for fewer patents? What impact will that have on the future competitiveness of the company? I suggest that cost savings can be realized AND that companies can strategically manage their IP portfolios at the same time – i.e. be more efficient in the short term, without sacrificing competitive advantage in the long term. In these tough economic times, IP departments are caught between a rock and a hard place: asked to spend less (cut your budget by 20% please), but ensure future revenue streams are protected (you better not let anything slip through the cracks). The more I think about it, the “rock-and-a-hard-place” analogy is probably not harsh enough. A more applicable analogy is one of being caught in a vice: on one side the need to lower expenses is pushing in. On the other side, the need to protect the company's business strategy and future revenue streams is squeezing in the opposite direction. There is constant pressure. 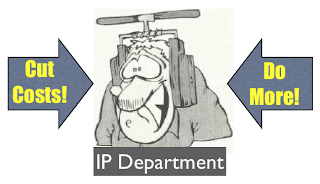 The effect of the economic downturn is to apply a few additional twists to the vice, squeezing IP departments even harder. When companies sought efficiency from CRM solutions, they didn't focus solely on cost reduction at the expense of losing valuable customers. They took a strategic approach that included being more efficient and saving money. For example, they used the exercise as an opportunity to focus appropriate resources on the most valuable customers, and consciously decided it would be okay for other non-core or non-profitable customers to leave the fold. IP management should be handled in a similar manner. IP departments should become more efficient and reduce costs, but not at the expense of the competitive advantage their business derives from its IP portfolio. Reduce IP-related expenses: streamline communication with outside counsel firms, say good-bye to the multitude of partial-hour billing line items related to administrative overhead & communication, prioritize invention disclosures so only the most important inventions evolve to a patent application, allow unused patents to lapse. Be more strategic: analyze the results of your portfolio mapping, assess relative areas of strength and weakness, rate & rank patents by relevant business grouping, set & measure progress against patent production goals that align with the growth plans of the company, profile competitive IP portfolios, patent for strategic advantage in your market. I don't know who originally penned the thought, but I've heard it said recently that no company has ever saved its way to success. Successful companies invest their way to growth. They invest in innovation, they invest in business process and infrastructure and they invest in their people. The companies who invest in IP and their ability to strategically manage their IP portfolios will benefit from cost savings in the short term and competitive advantage in the long term.